What's a witch without her magic? Not much of a witch, that's for sure. But, the witches still exist in NBC's Emerald City, even if they are banned by the Wizard from using their powers. The Wicked Witch of the East is played by Florence Kasumba. In the 1939 The Wizard of Oz movie, the Wicked Witch of the East was killed when Dorothy's house fell on top of her after coming out of the tornado. The only thing we saw as viewers were her ugly witch feet sticking out from under said house. Will this new Wicked Witch of the East have the same fate? You'll have to watch to find out. One thing that is for certain: Kasumba makes for one gorgeous witch! Ana Ularu plays West (as in the Wicked Witch of the West though that's not her official title here). You won't be seeing her wearing green makeup, and we're not even sure if she's genuinely wicked. She seems more likely depressed to us. Unless you count running a brothel as wicked, because that's what she does in this version of the Oz tale. We have to be honest, from what we've seen so far, West is our favorite. Maybe it's because we have a soft spot for the dark side. 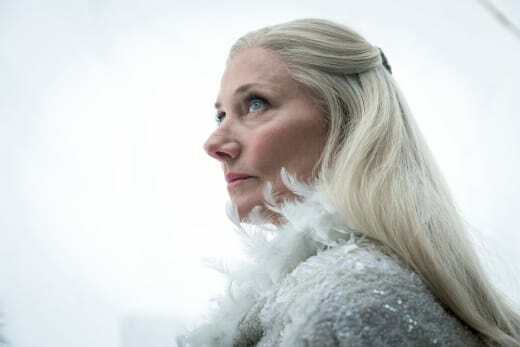 Glinda, formerly known as Glinda, the Good Witch, is played by Joely Richardson. She's not handing out any ruby slippers to Dorothy (which weren't really ruby in the books, but that's another story). Instead, this Glinda owns an orphanage. We can't wait to see what other surprises Emerald City throws our way, but the video below is all about the witches. Take a look! Emerald City Season 1 Episode 1 and Emerald City Season 1 Episode 2 premiere this Friday, January 6 at 9/8c on NBC! Will you be tuning in? Let us know! Be sure to check back here for our review of the two-hour premiere after it airs. Emerald City Season 1 Episode 2: "The Prison of the Abject", Emerald City Season 1 Episode 1: "The Beast Forever"
Do you really want to know what I wish for? I wish there was more. Permalink: Do you really want to know what I wish for? I wish there was more. Aunt Em: Dorothy, she's your mother.